Well, today was an excellent day. Joe was planning to come over to finish up the right top skins, so while I waited, I started in on dimpling the aileron skins (just the stiffener holes) with the c-frame. All went pretty well, except for a place where I dropped the c-frame die on the skin (top surface, of course). It made a little dot impression, so I flipped the skin over on the MDF and gently tapped with a hammer until it came out. (NOTE: do not put a bucking bar behind it thinking that will be better. The wood has a little give to it, so you don’t deform the skin. If you use the bucking bar, you’ll squish the skin. Ask me how I know.) 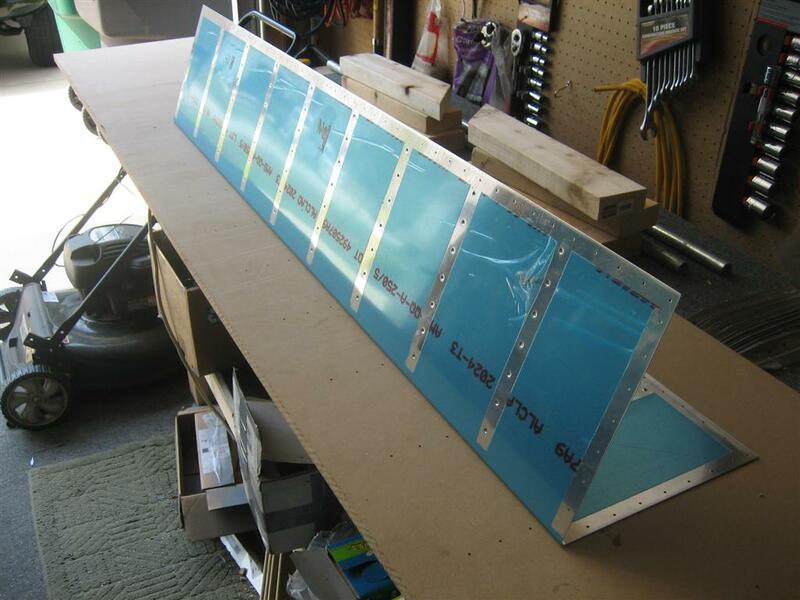 I think I have to paint the ailerons now (instead of polishing). Before Joe and I got started, I snapped this picture of the “every other” method I’m using. 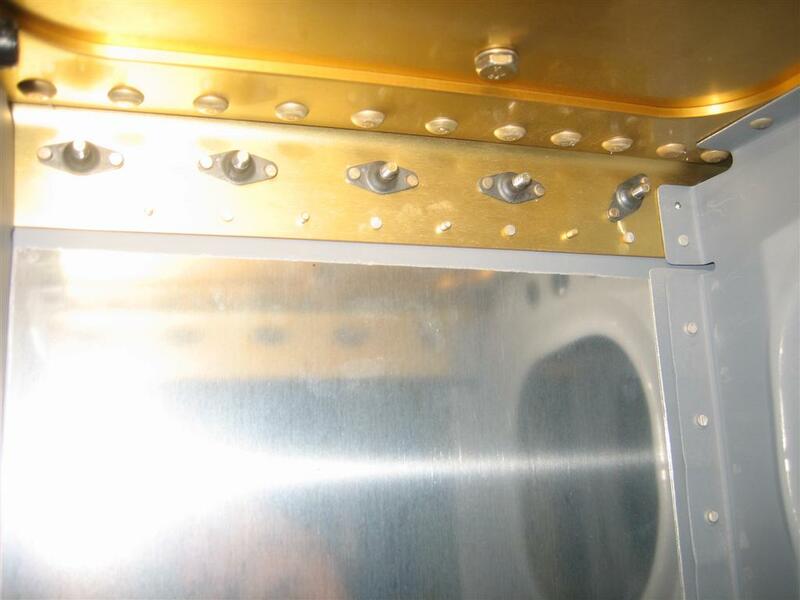 The rivet row we're working on here is at the bottom of the gold spar flange. After a whole bunch of bucking and shooting, we came up with this. For the last three rivets, we switched places so Joe could get some experience bucking and I could say I shot a few of the rivets on the skins. Turns out, I like bucking better and Joe likes shooting better. If you look really closely, towards the foreground on the inboard top skin, I wrote 38, 5, 80, 43. That’s how many rivets we bucked. 166. 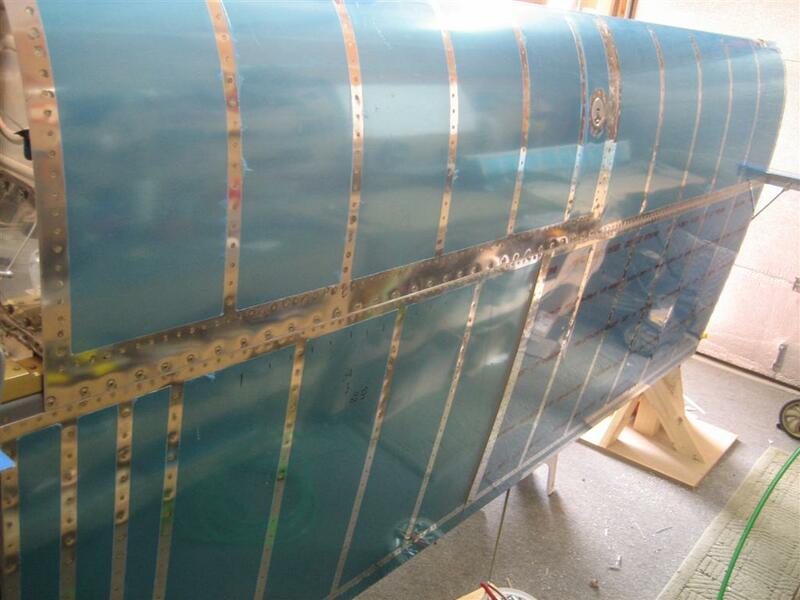 0.5 hours on the aileron skin, then 45 minutes (or 1.5 man-hours) on the skins. 2.0 total. This entry was posted on Saturday, September 3rd, 2011 at 3:00 pm and is filed under Wings. You can follow any responses to this entry through the RSS 2.0 feed. You can leave a response, or trackback from your own site.